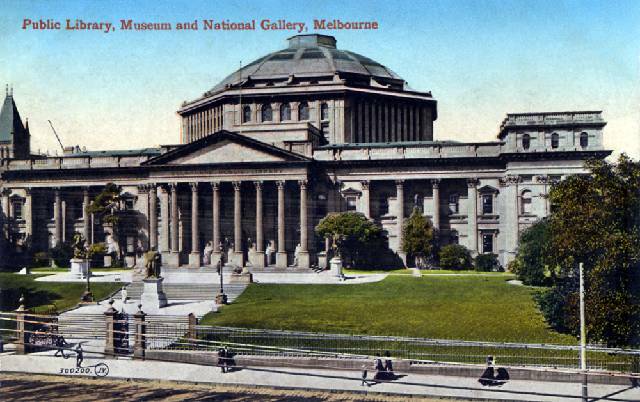 Begun in 1853, The State Library of Victoria has also been home to the National Museum and National Gallery. 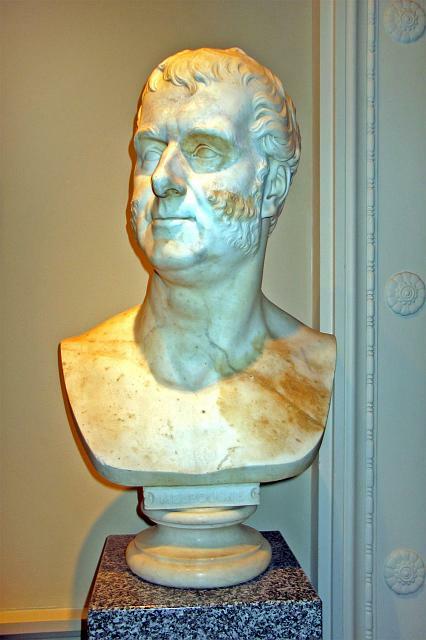 Joseph Reed’s competition-winning Roman Revival design was extended many times by his successors. 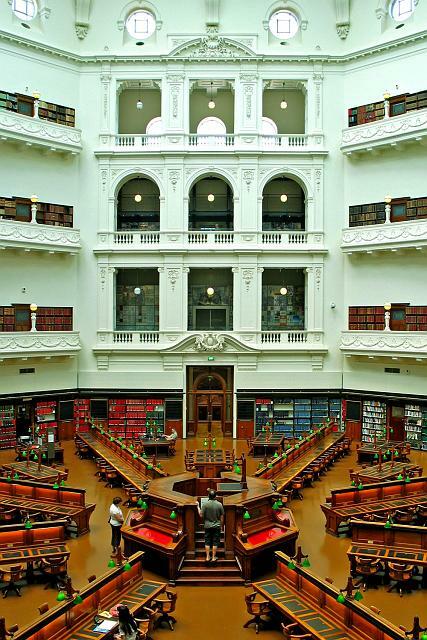 The barrel-vaulted reading room that is Queen’s Hall houses one of Melbourne’s grandest 19th-century interiors. 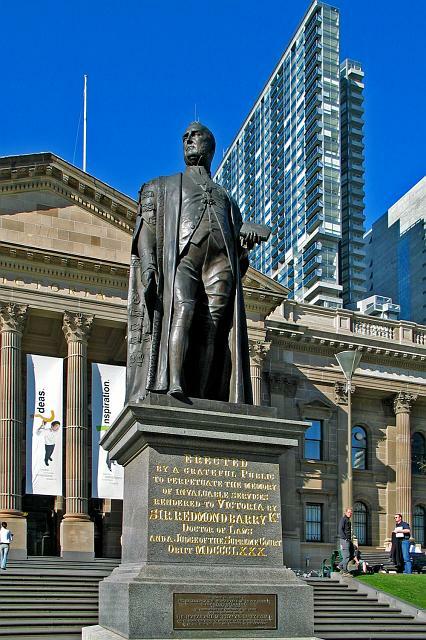 The library’s founder, Sir Redmond Barry (who envisioned Melbourne as the Rome of the south), stands proudly before one of Victoria’s most loved institutions. The domed Reading Room (1906-11), designed by Bates Peebles and Smart, was for a short time the world’s largest reinforced concrete dome. 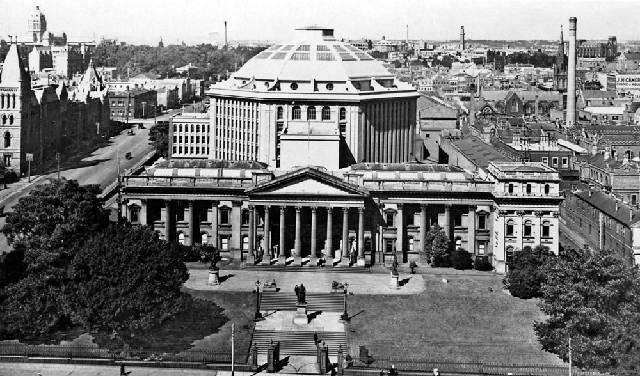 The dome, which was constructed using the system of steel bar (Kahn bar) reinforcing developed by American Albert W Kahn in 1902, covers a panoptic layout of reading tables and an overseeing librarian, and sits on a classically composed polygonal drum which rises over four levels and is punctuated by arched openings. 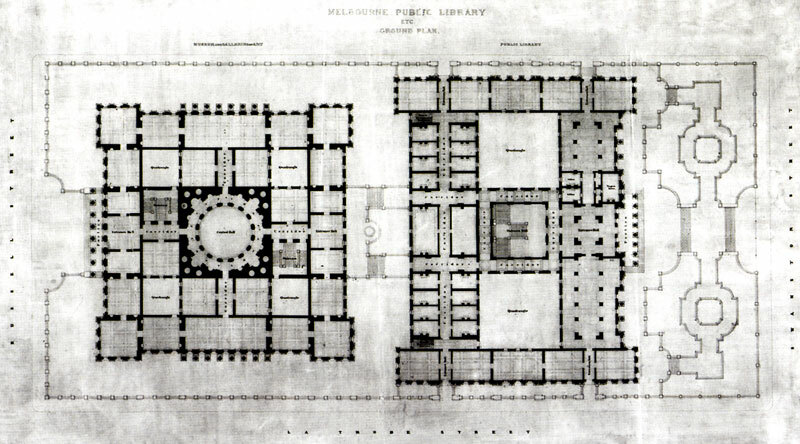 and below the original plans with rear museum tower. 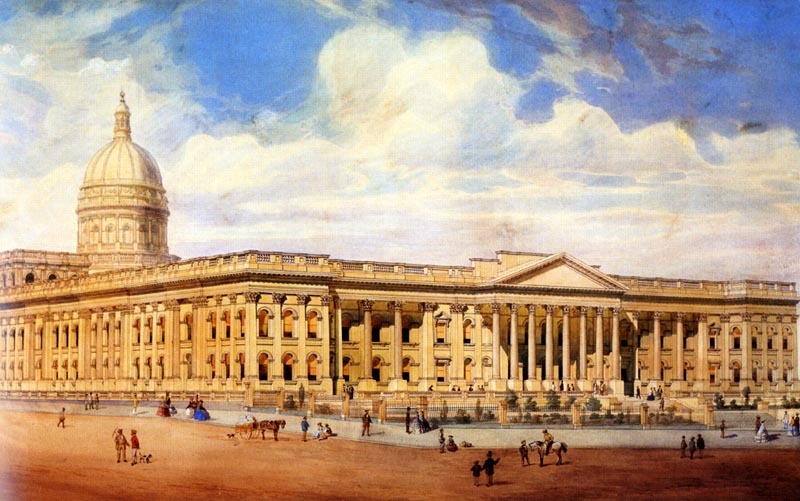 Queen’s Hall, above and below. 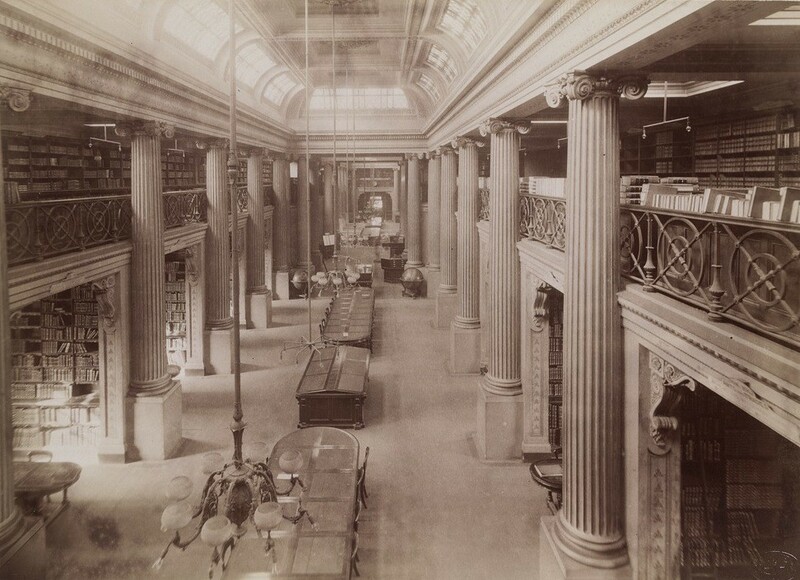 Some early postcards of the library. 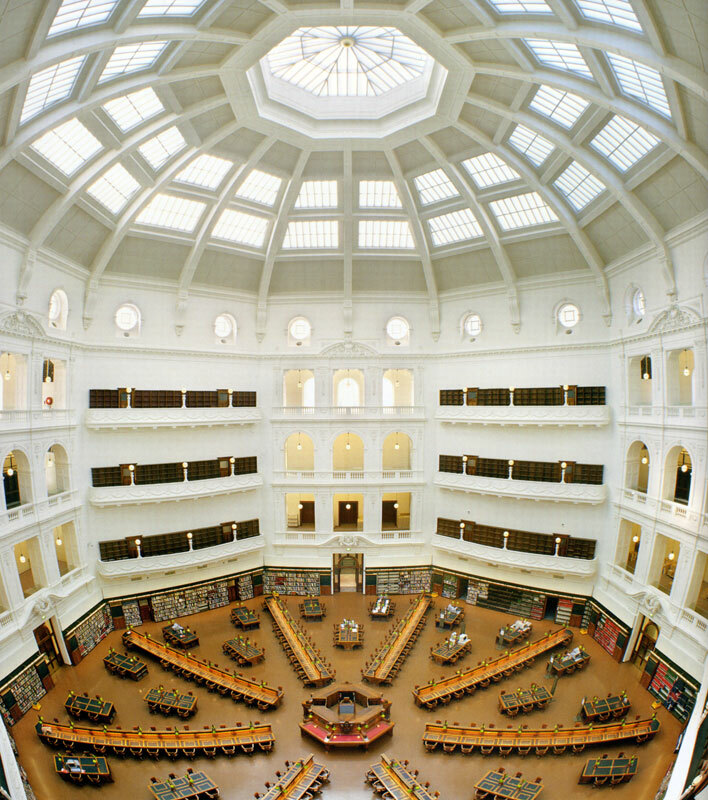 My own photographs of the State Library. 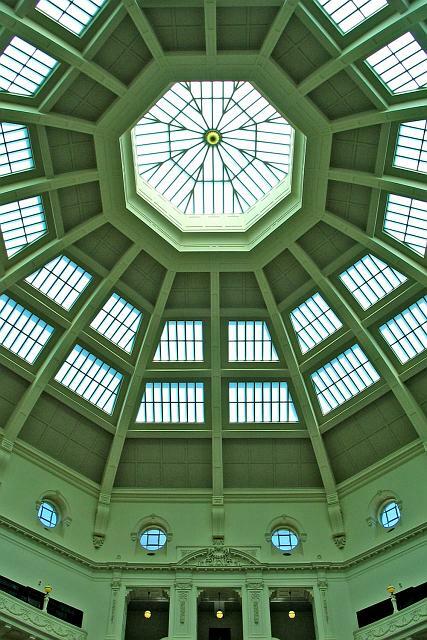 The very impressive interior of the State Library dome, now known as the La Trobe Reading Room. Photographs I’ve recently shot of the Library interior. 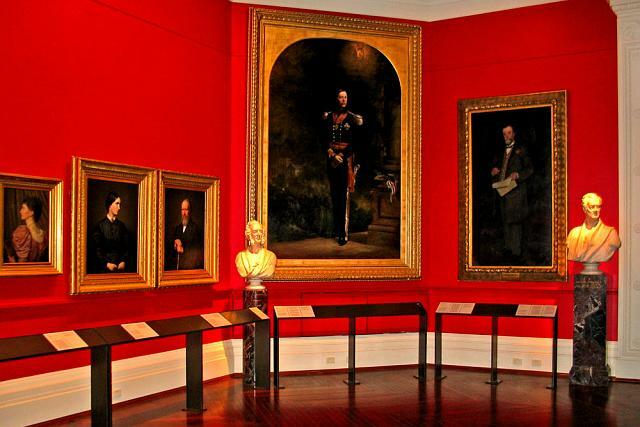 Above, the red Stawell Gallery, below, looking in from the Cowen Gallery and after that, no other than a bust of Melbourne’s namesake, Lord Melbourne. 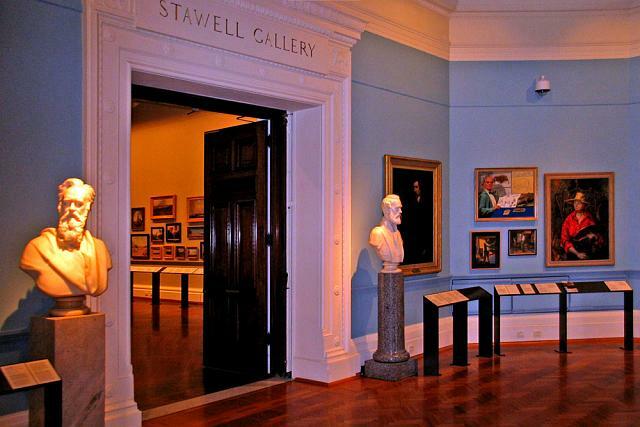 Below, the blue Stawell Gallery. Interior the Library dome below. 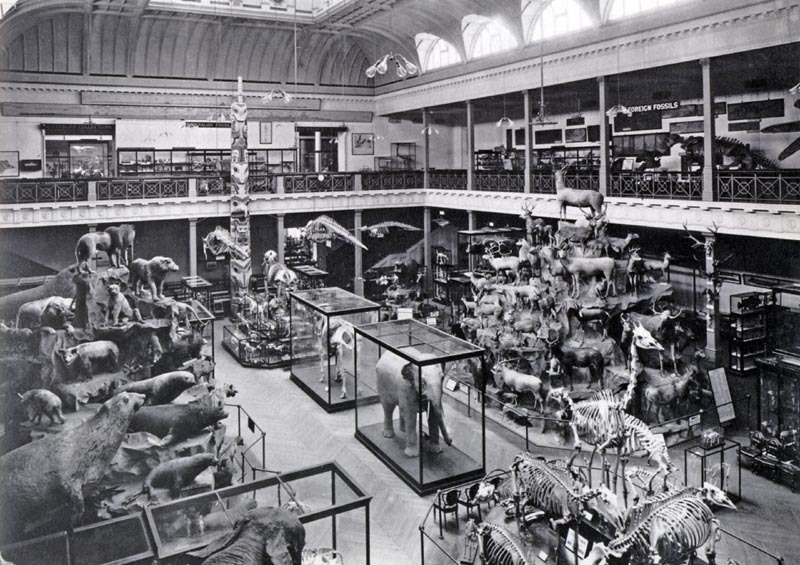 McCoy Hall ~ 1911, when it was part of the former museum, now looking quite different and called the Redmond Barry Reading Room. 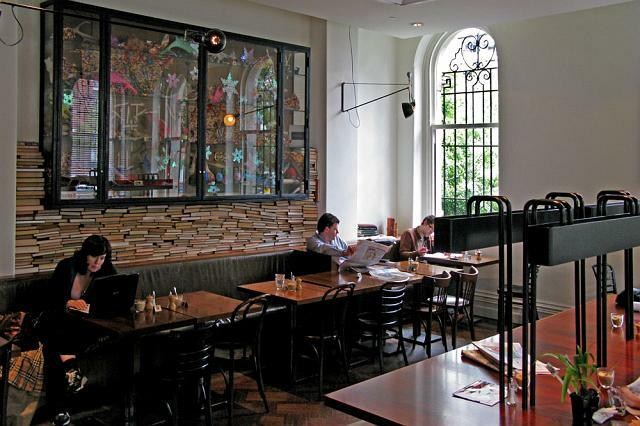 Mr Tulk Café at the library with its entrance on La Trobe Street. 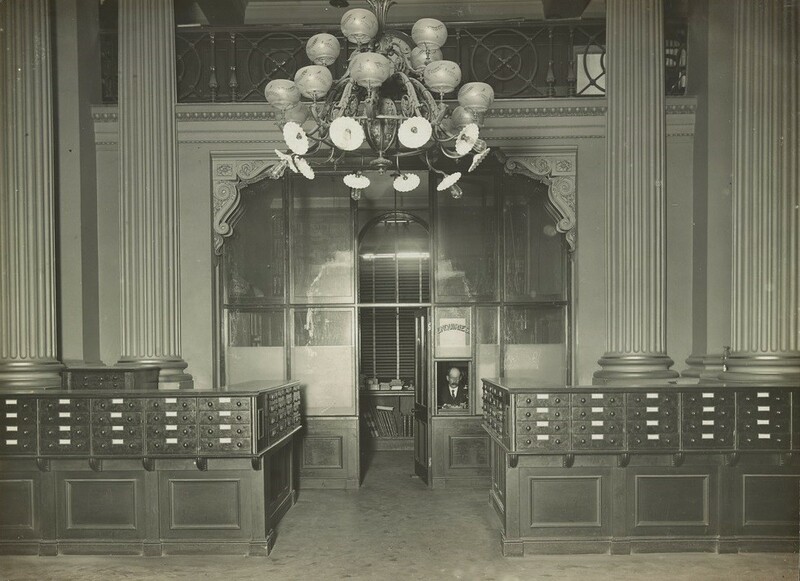 Interior of The Queen's Hall, showing a member of staff sitting at the enquiries window ~ 1910. 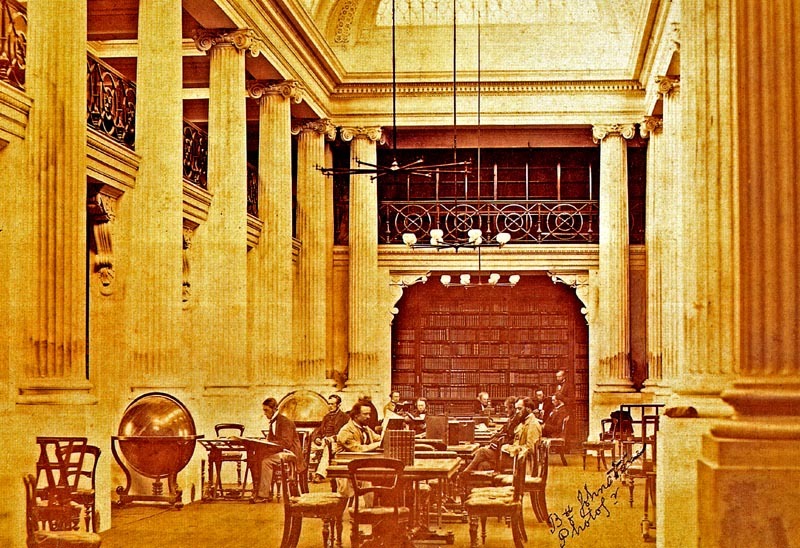 Queen's Hall looking south in 1900. 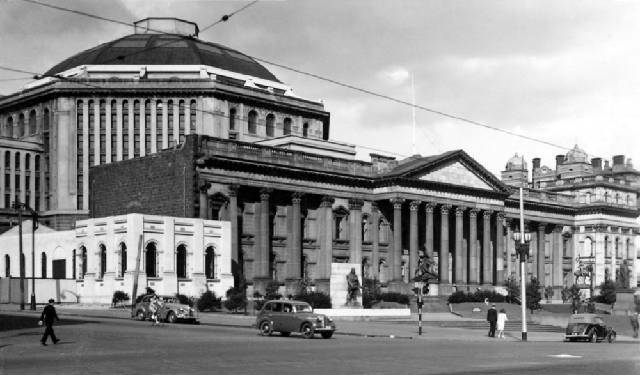 The State Library has embarked on a five-year redevelopment funded by a $55.4 million budget allocation from the Victorian Government and $28 million in philanthropic contributions. It is scheduled for completion by 2020. This significant redevelopment project will transform the Library so we can better meet the current and future needs of the community. 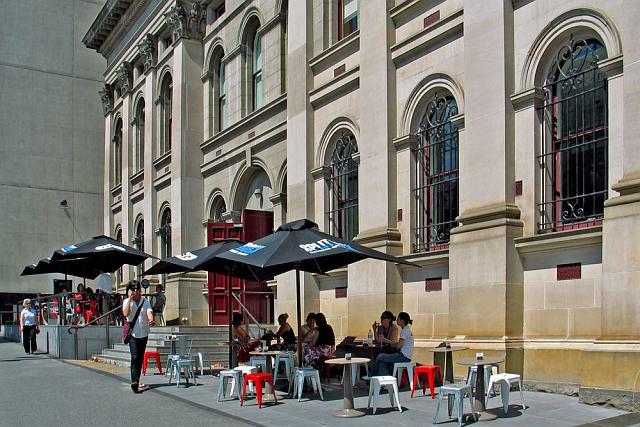 The focus will be on optimising sections of the building to open up an additional 1000m2 of space for public use, as well as developing programs and facilities that provide vital and improved economic, cultural and education opportunities for all Victorians. 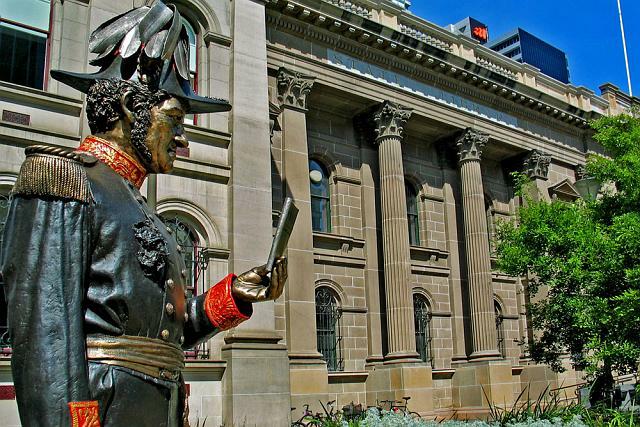 • Restoring historic Queen’s Hall as a public reading room and building new rooftop garden terrace. • Reopening the Russell Street entrance alongside a new major exhibition space, as well as cafe, retail and visitor services. 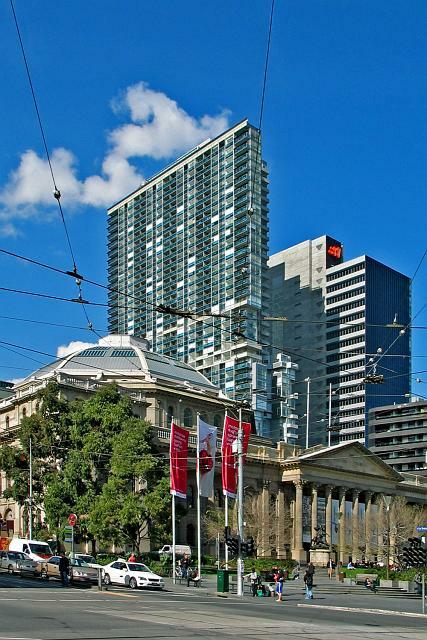 • Establishing an innovation hub that incorporates a centre for entrepreneurship to support Victorian enterprises, and a centre for digital media with e-Town Hall facilities to provide access to the latest communication technologies and connect with regional centres and public libraries across the state. • Creating new dedicated spaces for children and young learners to support families in fostering early literacy and a love of reading. 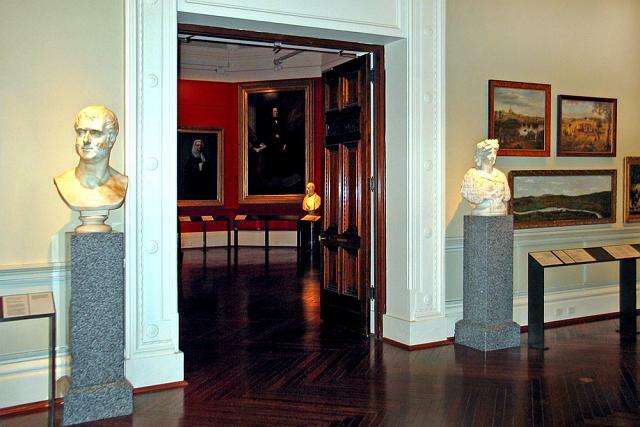 • Reconfiguring the dome annulus galleries into open-access collection areas with more study spaces and a VIP lounge. 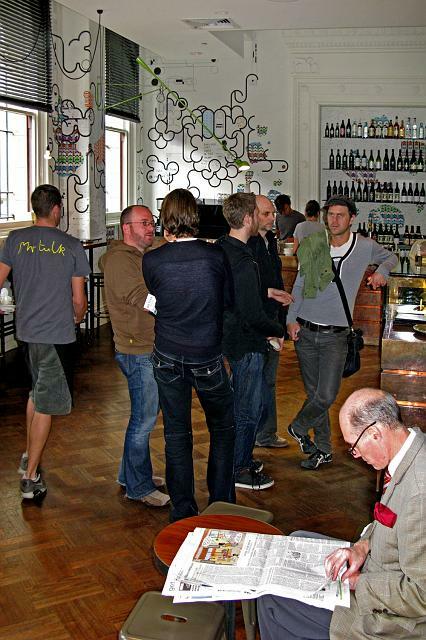 • Refurbishing the theatre and conference facilities to meet industry standards. • Relocating staff office areas to open up more public space. Minister for Creative Industries Martin Foley was at State Library Victoria today to announce a $10 million donation from the Ian Potter Foundation, which will contribute to the refurbishment and reopening of the historic Queen’s Hall. 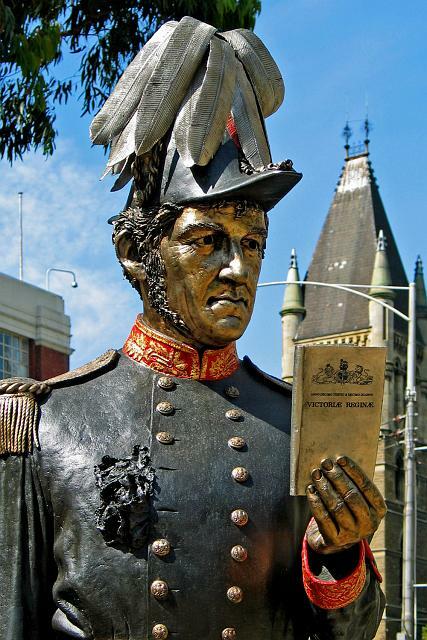 In honour of the donation – the largest ever received by the State Library – the 156-year old hall will be renamed the Ian Potter Queen’s Hall. 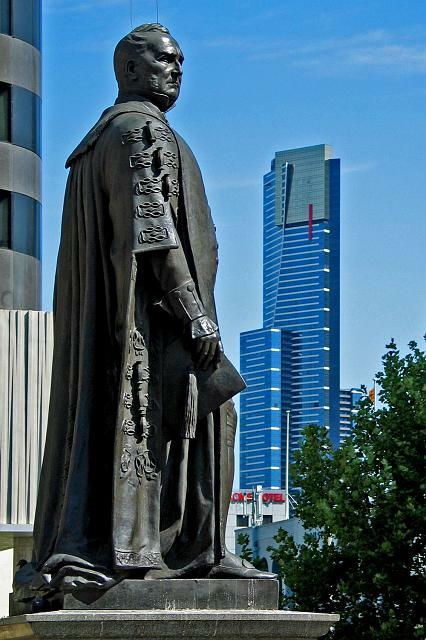 The Melbourne-based Ian Potter Foundation was established by Australian financier, businessman and philanthropist Sir Ian Potter (1902-1994). 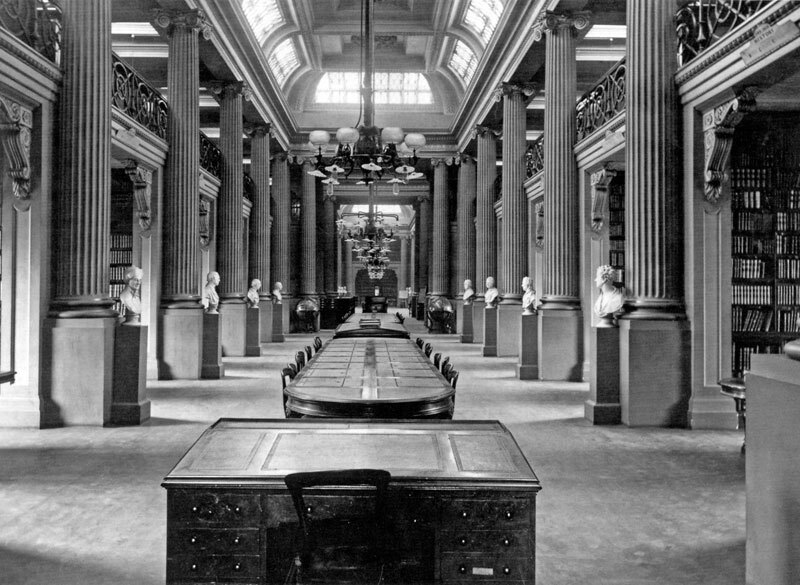 It is now one of Australia’s major philanthropic foundations and has a 50-year history of support for State Library Victoria. 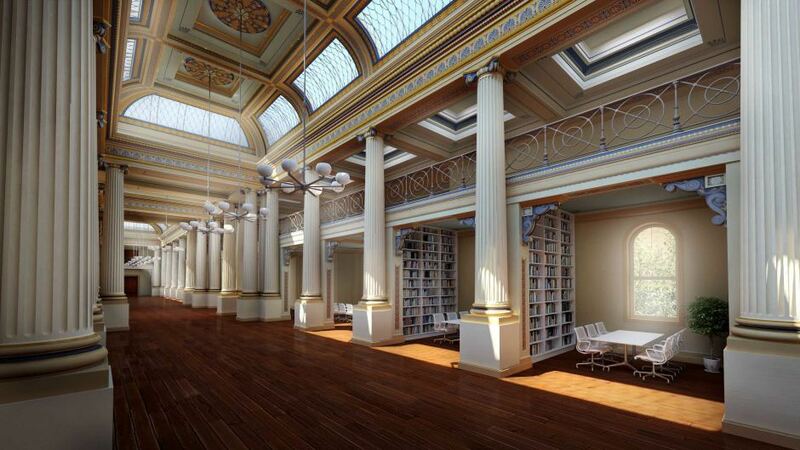 The Queen’s Hall refurbishment is a key feature in the Library’s $83.1 million redevelopment. 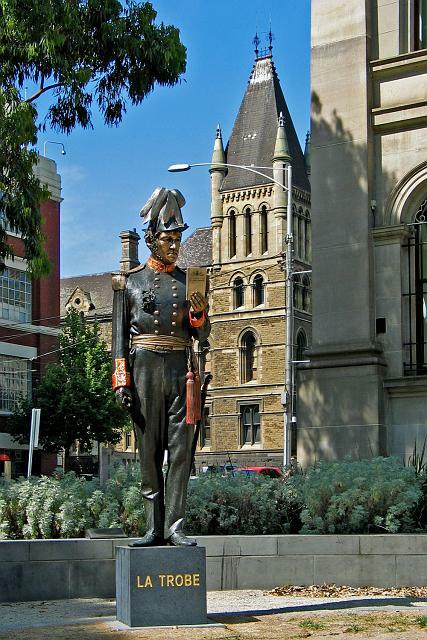 In the2015-16 Victorian Budget, the Andrews Labor Government contributed $55.4m to the project, with the remaining funds to be raised by the State Library. 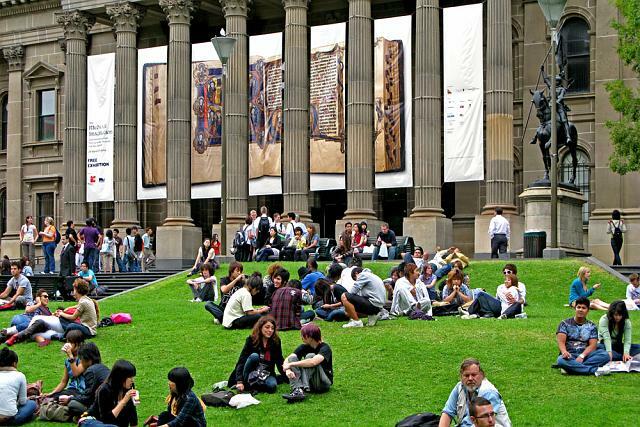 A consortium of internationally celebrated architects has been selected to design the $83.1 million State Library Victoria Vision 2020 redevelopment. Multi-award winning Australasian design firm Architectus will join forces with Schmidt Hammer Lassen Architects, one of Scandinavia’s most recognised architectural practices, to transform the iconic building. Architectus is known for its delivery of complex and technically challenging projects, receiving more than 100 industry awards for work across education, public, commercial, infrastructure and transport projects. 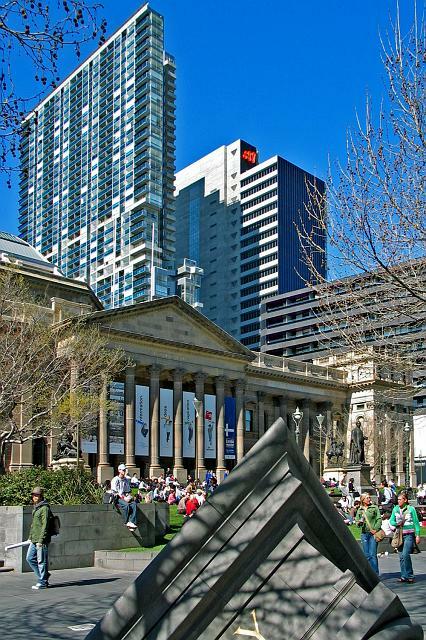 Their projects include the 6-star Greenstar Sydney office tower 1 Bligh St, and collaborations with the Art Gallery of NSW’s Sydney Modern with SANAA and the Queens Bridge Tower in Melbourne with Wilkinson Eyre. Schmidt Hammer Lassen Architects is a global leader in contemporary library design, with projects including Scandinavia’s largest public library, the Dokk1 Urban Mediaspace, Halifax Central Library, Sir Duncan Rice Library at Aberdeen University and the extension to the Royal Library in Copenhagen. Architectus + Schmidt Hammer Lassen recently collaborated to design the Christchurch New Central Library, which is due for completion in 2018. Architectus + Schmidt Hammer Lassen supported by Andronas Conservation Architects, Irwin Consult and Steensen Varming Engineers will design all elements of the Vision 2020 redevelopment. Design concepts for the Vision 2020 project will be released later this year with construction due to begin in 2017 and will be complete in 2020. 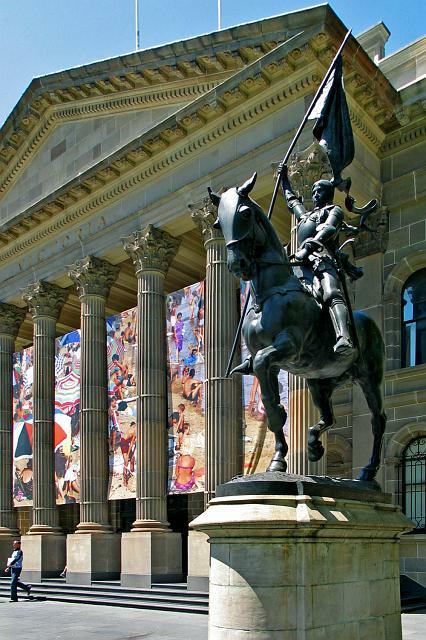 State Library CEO, Kate Torney said the designs are a stunning culmination of input from across the community. 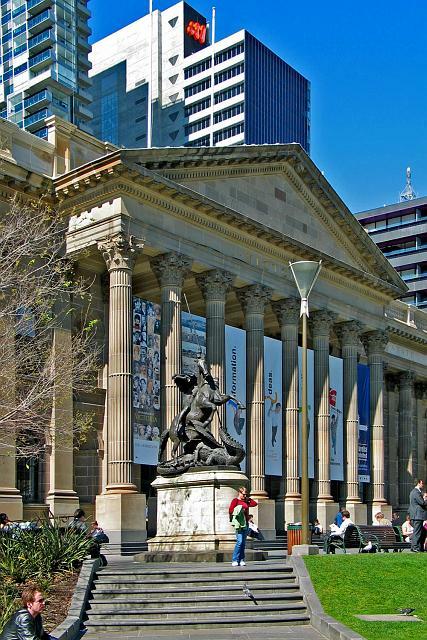 Works are about to kick off on State Library Victoria’s Vision 2020 project, with Built construction group appointed as head contractor for the $88.1 million redevelopment. 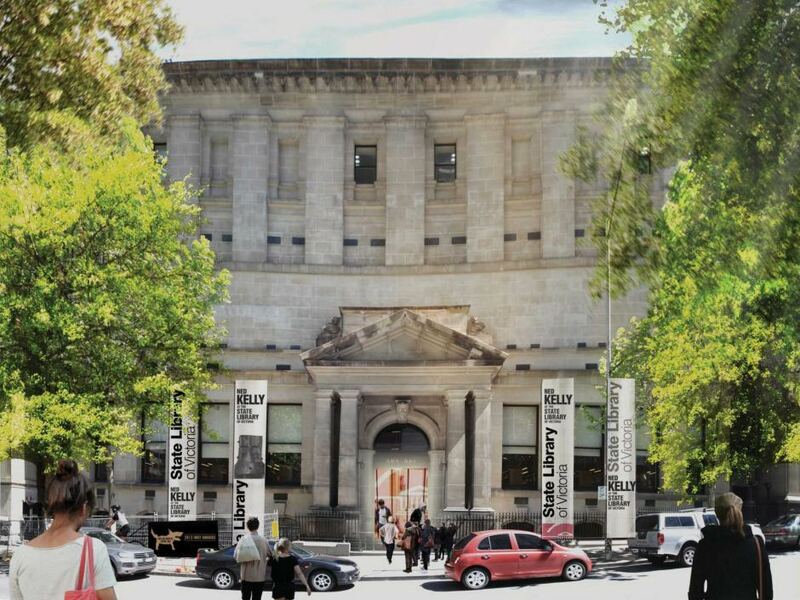 Vision 2020 will transform Australia’s oldest public library, opening up 40 per cent more space for public use, including reopening and restoring the majestic Ian Potter Queen’s Hall and the historic Russell Street entrance. It will also create dynamic new spaces for children and families, teenagers, entrepreneurs and start-ups. Built was selected from a shortlist of four companies and has a strong history of delivering projects in constrained central business district locations, having previously worked on projects such as Canberra’s Australian War Memorial, Sydney’s State Theatre and the Melbourne GPO Building. At the peak of work Built expects to employ 140 workers on site. 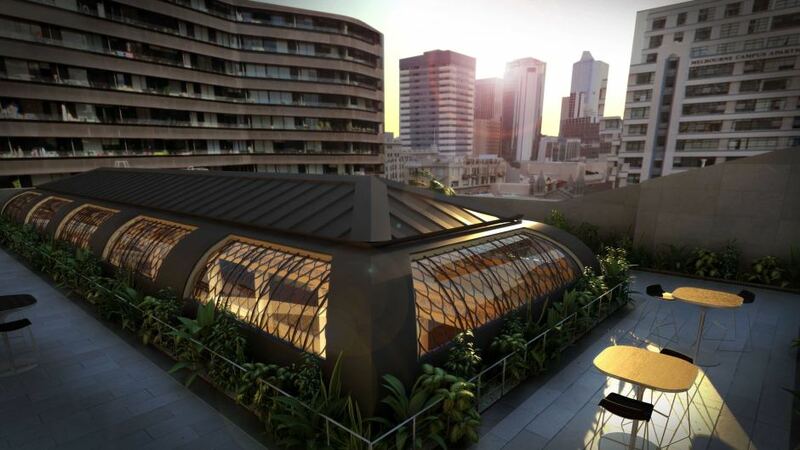 Australasian design firm Architectus with leading Scandinavian architects Schmidt Hammer Lassen have developed the designs for the redevelopment, which is due for completion in 2020. The Andrews Labor Government has funded $60.4 million of the $88.1 million redevelopment with the remainder sourced from philanthropic donations. Work is expected to begin on site later this month.